From farmers markets to urban farms, people are finding creative ways connect through food. Author Anna Lappé and chef Bryant Terry discuss the importance of food in nourishing our communities. What’s the relationship between food and community? Bryant Terry: Food and community are inseparable. I rarely I eat alone, and I don’t like eating alone, because I think food should be shared with other people. It’s important to me in the work that I do with young people, who often have parents who are working more than one job, who are busy and might not have the opportunity to share a family meal. I love giving them the opportunity to experience that with a group of their peers, and helping them think about ways for us all to be a community and share food, so that we’re getting fed on multiple levels. Anna Lappé: Food plays an essential role in building community. One of the things that has changed so much in just my lifetime is our relationship to food and community. Many of us no longer have the experience of having meals together with our families, friends, and classmates. It’s exciting to see that there’s a renaissance of people realizing how important it is to use food as a way to connect with each other. People are doing this in all kinds of creative, inspired, and fun ways. What are some examples of building community through food? 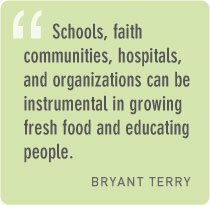 Bryant Terry: Schools, faith communities, hospitals, and organizations can be instrumental in growing fresh food and educating people about sustainable food. For example, we’ve seen innovation in Berkeley, California, with The Edible Schoolyard at Martin Luther King Jr. Middle School. In Brooklyn, New York, the nonprofit organization Added Value converted a formerly vacant playground into an urban farm that produces 12 tons of produce each year for the community. This type of innovation should serve as a model for other institutions to take advantage of space, people, and capital to produce more food. How many hospitals across the country have huge parking lots that could have farmers markets once per week or more? How many churches could be growing food on their grounds? 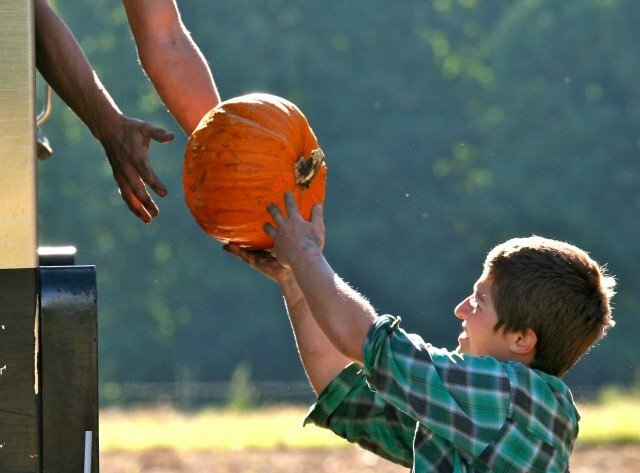 How many community-based organizations could be connecting with rural farmers and starting CSAs to bring fresh food into the local community and distribute it among their members? How can we nourish our communities through food? Bryant Terry: We have opportunities to tap into existing organizations to grow this movement. It’s up to us as members of these organizations and faith institutions to encourage them to be a part of this movement and do whatever they can to help support it. 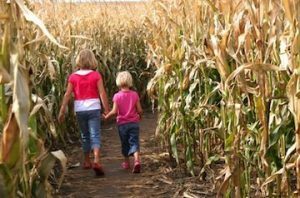 Anna Lappé: When we start trying to make healthier choices, we discover that many of the choices that are good for our own personal health are also good for the environment, our community, and our local economy. It’s a virtuous cycle. Choosing the right food for our bodies helps the environment and farmers. There’s an incredible ripple effect way beyond just that one choice.